Top 10 Essential Accessories for Men and Women | Save. Spend. Splurge. I talked about the 10 Essential Items in a Wardrobe for Men and Women, and here are my 10 Essential Accessories for Women. For women, it becomes a bit more complicated with accessories! Now it comes down to the shoes. Some women have foot problems, and have to wear those clunky looking orthopedic horrors (I sympathize, I really do), but I should point out that you can get Birkenstock half insoles for your boots. It makes an immense world of a difference having Birkenstock hard half insoles in my boots. Any flat feeling boot that would otherwise hurt my feet, becomes a joy to wear for very long periods of time with Birkenstock insoles. The style of riding boot can differ as well — Frye makes some slouchy, more cowgirl style boots which look nice, but I veer towards the harder, stiffer leather boots with an equestrian look to them as a personal preference. Dark brown would be my colour of choice, mostly because I hate black, and anything lighter would be a secondary pair of boots. 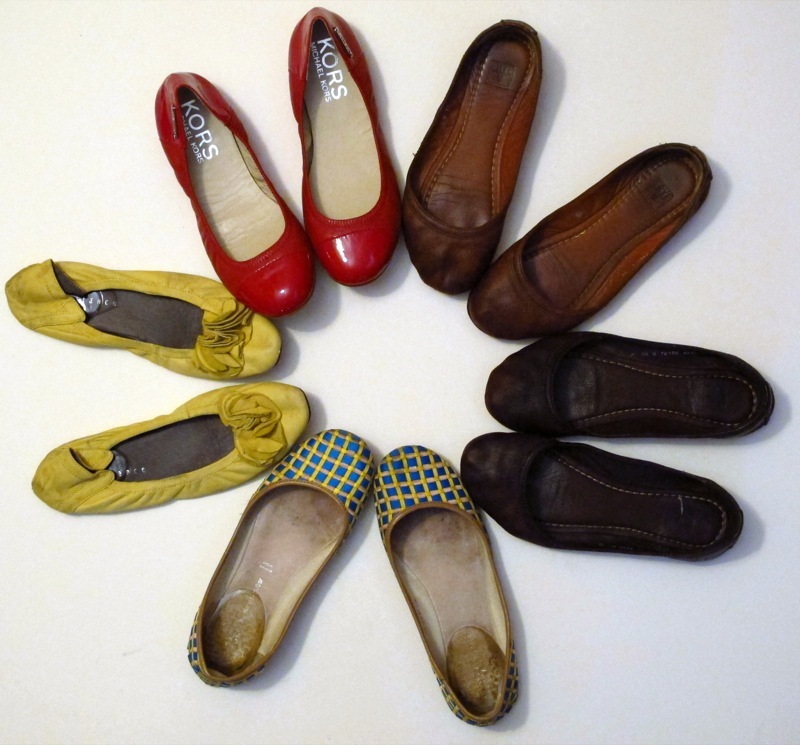 Everyone is groaning now, but I really do love a good ballet flat. It doesn’t even have to be fancy, but it has to be comfortable with a bit of a padded insole, and a high enough vamp (the part that covers your toes) in a soft leather so that you can walk comfortably without blisters. 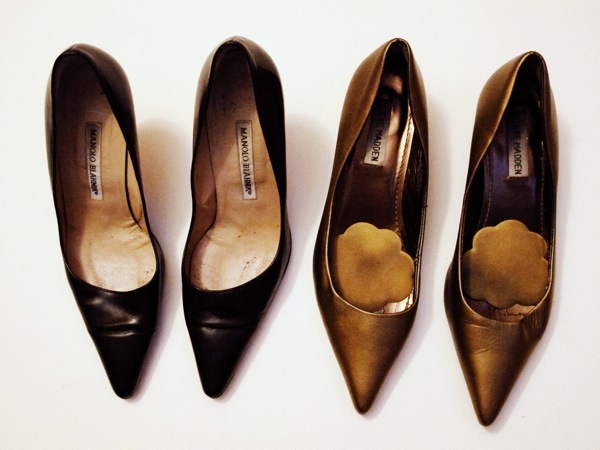 Ballet flats take place in an outfit when boots, trainers or heels simply don’t work. Casual but slightly dressier outfits scream for ballet flats over trainers, and I have inwardly sighed many times at seeing the wrong footwear paired with an otherwise lovely outfit. Unless you’re making a specific fashion statement (you know, a 90s style grunge look with Keds paired with skirts), skirts are always best worn with ballet flats in my opinion. My absolute favourite pashmina is from White and Warren in a very neutral oatmeal colour. I wrap it around my neck pretty much the entire time during winter, and sometimes I layer that pashmina over other lighter scarves for another look. Either in a solid white, or in a pattern, large silk scarves (not those tiny square ones that barely knot around your neck), are for me, best worn open over outfits, perhaps wrapped ONCE around your neck so that the other half flies in the wind when you walk. Plus, scarves never grow too small for you or end up too big. They’re always the right size. I like big, chunky, real-stone necklaces in bright colours because you can just wear it over a t-shirt and look instantly more polished than you did 2 minutes ago. I like bold colours because they add a pop and the first one I would buy would be a bold, deep crimson red. Otherwise, a deep blue is also a very beautiful colour to wear. A watch sounds so outdated in today’s times with iPhones and all sorts of digital clocks surrounding us, but there is something really nice about an analog watch with proper hands that lends an air of intellectual sophistication to your wrist. I myself prefer really large, thick, watch faces, almost like men’s watches with a simple white face, black hands, and a brown leather band. Dainty watches were never my thing, and although it is now a bit of a trend to wear more masculine, larger watches, I’ve always preferred the look over a dainty one on my wrist. That said, small, dainty watches have their place in adding a very feminine flair and drawing attention to how tiny your wrist is (which is the whole reason why women’s watches so small and sometimes impossible to read the time from!). Whatever you choose as a watch — loud, plastic and colourful, or something chunky and masculine, to a chain watch that is dainty and elegant, a watch is a practical and an essential accessory for me. 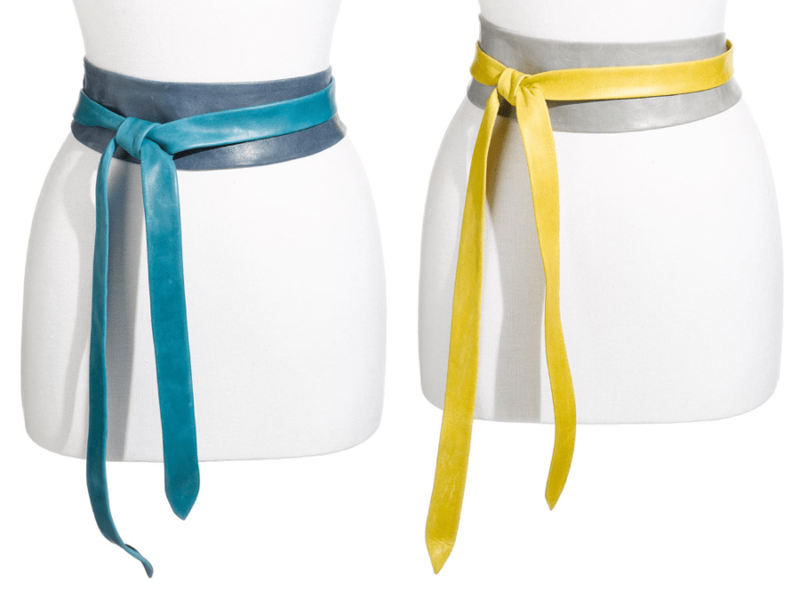 I personally adore obi belts. I own no less than 10 of them I think, in varying fabrics and colours. An obi belt just ties everything together for me. It adds an extra pop of interest to the waist of a dress either to contrast the look (e.g. an orange grey patterned print dress with a yellow and grey belt), or to make it look like I actually have a waist. It draws attention to the smallest part of your body (your waist), gives you a nice hourglass, cinched look, and needs no other accessory! Before I go into styles I’d like to talk about WHY you should buy good sunglasses. Polarized lenses are way more expensive to be sure (they start in the $150 range and go up to $$$$$$ of money depending on the brand name), but if you don’t buy a good pair of sunglasses you will do more harm than good to your eyes. Sunglasses as a rule, shade out the brightness of the sun and make your eyes dilate to let in more light, but if your sunglasses don’t offer any protection, you are simply just opening up your eyes to increased, intense, PERMANENT sun damage without knowing it. The effects of such damage may not be apparent early on, but as you grow older, it becomes a problem, just as too much sun damage in your youth will result in skin cancer, wrinkles and sunspots by your 40s. This is also the reason why although children’s sunglasses come in cute shapes and make them look adorable, you shouldn’t put cheap sunglasses from the dollar store on kids. You’re just killing their newborn, delicate eyes earlier than usual. Yes, sunglasses are expensive and it’s crazy to many people to pay more than $10 – $30 for a pair, especially if you’re thinking of forking over $200+, but your eyes are worth it. Otherwise, no sunglasses at all might be preferable. Sure, you’ll get wrinkles in your forehead from squinting in the bright light, but at least you won’t be intensifying the sun damage to your eyes. Now that the lecture is over, on to sunglass styles! You do not need more than one unless this is your “thing”. This is harder than it looks, and I am blessed to have an oval shaped face which means I can wear any style, but I prefer rounded square shapes in sunglasses. They seem universally flattering on every face shape to me. Aviators are also nice shapes for sunglasses, and I somehow have gotten used to the big bug-eyed look of those massive sunglasses but could never bring myself to buy a proper pair at $200 a pop. They can come in a dark blue polarized tint or a warmer more golden one. I tend to like the golden tint better because it suits my skin tone, but you’ll know once you have them on! If you have a rather flat nose bridge, look for a pair in metal with structured nose pads so that they stay on your face and don’t slide down. If you have a prominent nose bridge (lucky!) you can wear either style, but I daresay a plastic frame will be more practical (you can flip it onto your head and not worry about it catching and pulling out your hair), and easier to clean. My last item is because I love wearing rings so much. 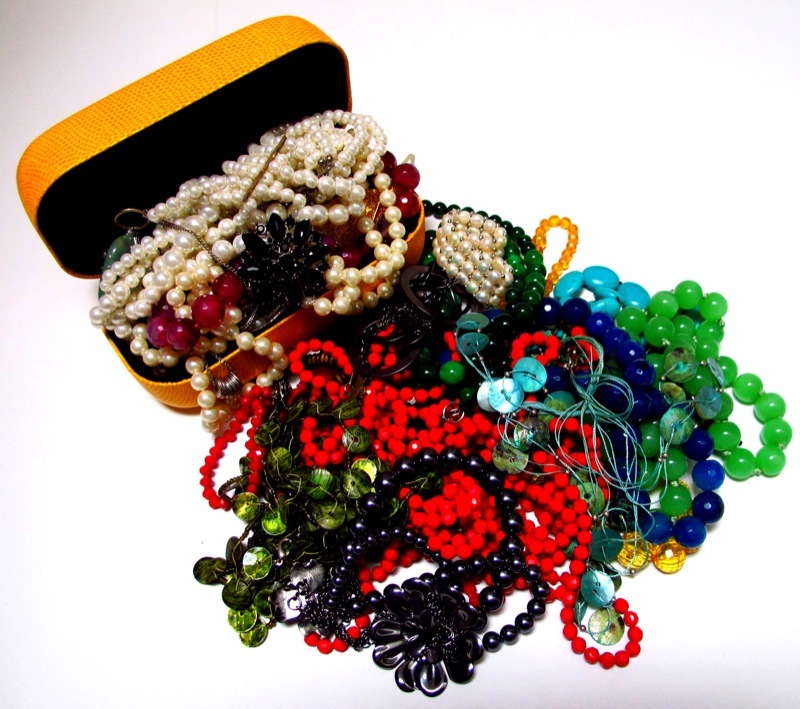 They’re easy to wear and not as conspicuous as a necklace or earrings, when I don’t want the jewellery to take over the outfit. 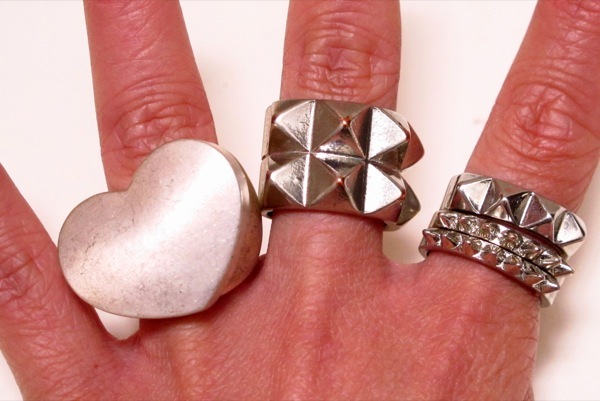 I like bold, sterling silver rings, but some people prefer delicate items. LOVE this list! 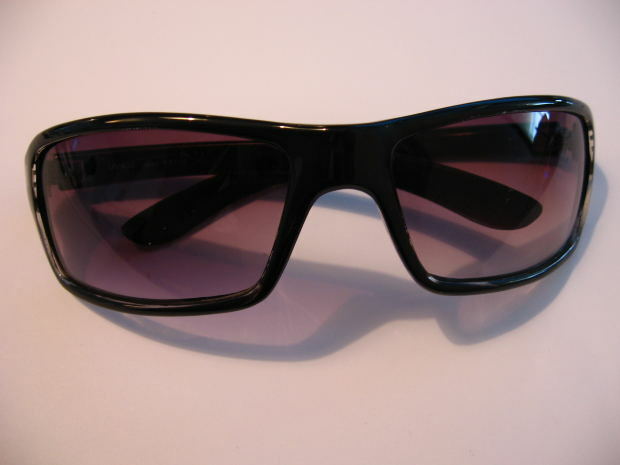 Men need a good pair of sunglasses too, my husband always laughs at deisgner sunglasses that are $300 but not polarized. The surf brands (Electric, Von Zipper, etc.) tend to have some good ones in the $100 range. I’ve never even seen an obi belt in a store but I will definitely check them out. Link broken so I figured I’d ask: where can I find me some comfy ballet flats that will neither flip flop on and off my foot with each step nor eat up my heel?